The Devon Legion Branch No. 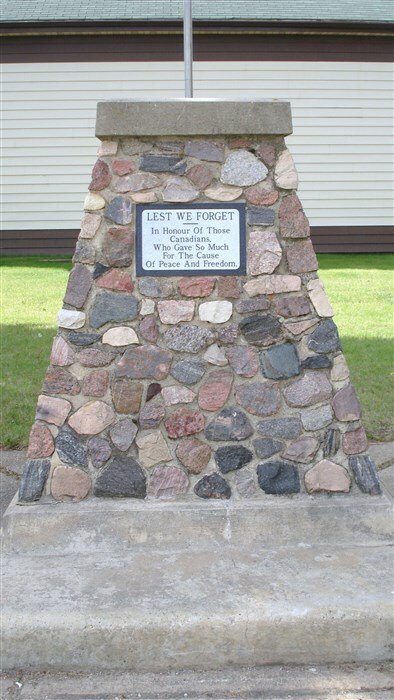 247 Cenotaph is located on the Devon Legion property at #6 Huron Street, Devon, Alberta. 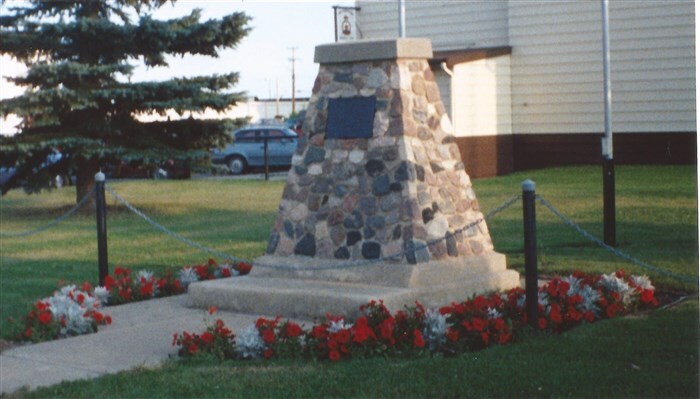 The Cenotaph faces north and is best viewed from Athabasca Avenue (Main Street Devon, Alberta). 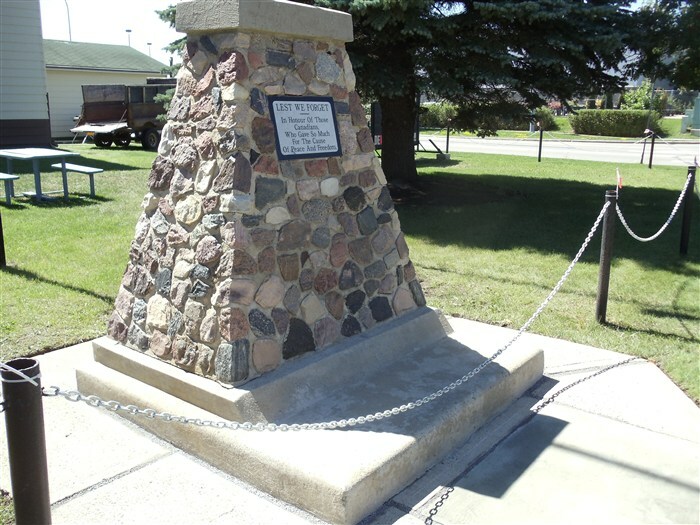 The Cenotaph is believed to have been designed by a local Devon Legion Member Mr. Irv Hennig and constructed by a local Devon business, Bighorn Maintenance Ltd., owned by Devon's former Mayor and Legion long service member Mr. Dale Fisher. The Cenotaph design is refered to as a "Fieldstone Cairn". 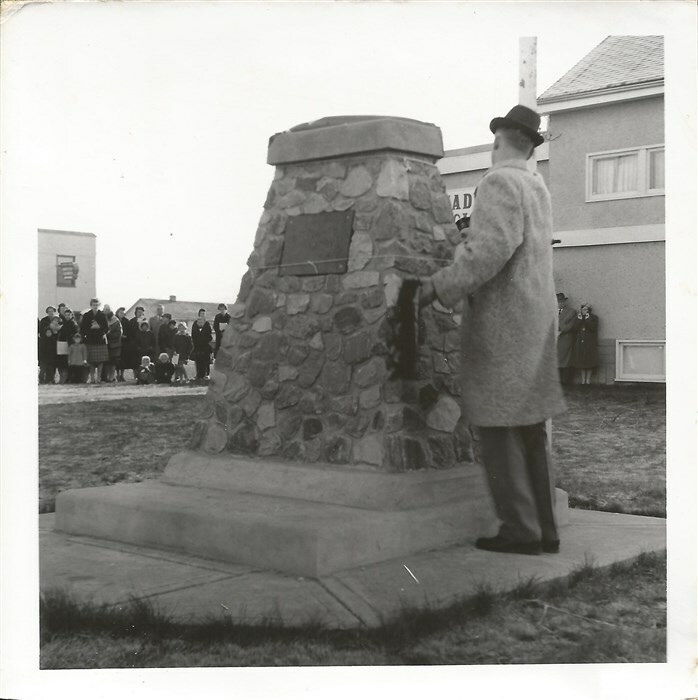 The Cenotaph was originally dedicated on November 11th, 1962 - Remembrance Day. 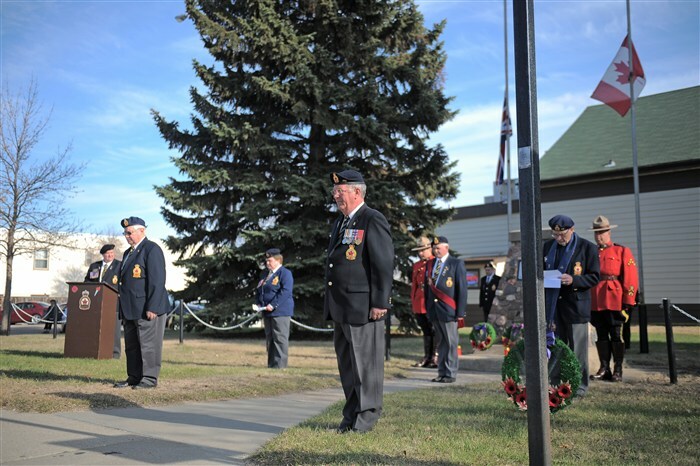 The Honour Guard was provided by members of Devon's own Militia the 19th Alberta Dragoons. The Cenotaph was draped with the Canadian Red Ensign, as the Red Maple Leaf Canadian Flag we are so familiar with today was not adopted by Canada until February 15th, 1965. 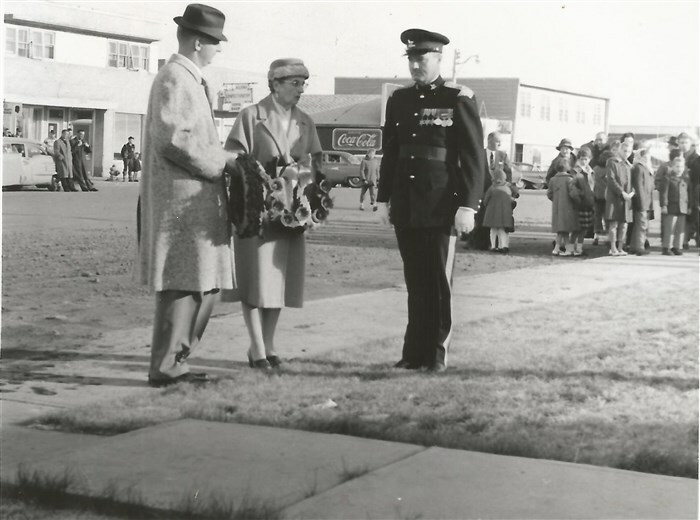 Major Bruce Eaton wearing his "dress blues" of the 19th Alberta Dragoons greeted the dignitaries for the unveiling of the new Cenotaph. The dignitaries included the Mayor of Devon Mr. Jim Henderson and his mother Mrs. Edith Henderson. Mrs Edith Henderson was a distinguished Silver Cross Mother having lost two sons to war. 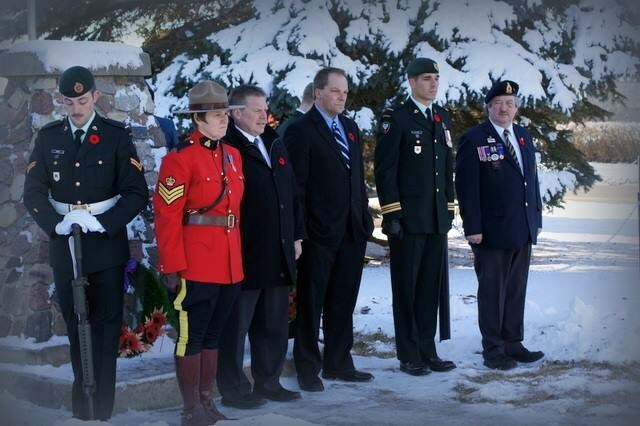 The Government of Canada's Veterans Affairs website lists this cenotaph as memorial 48024-007. The next photograph is the oldest colour photo found to date of the Devon Legion Cenotaph. The picture is from 1985 and shows that the Legion was just in the early stages of building a single chain fence around the Devon Legion property. Visible is a steel fence post that has not yet been painted black, capped with a decorative cap and connected with a white chain. 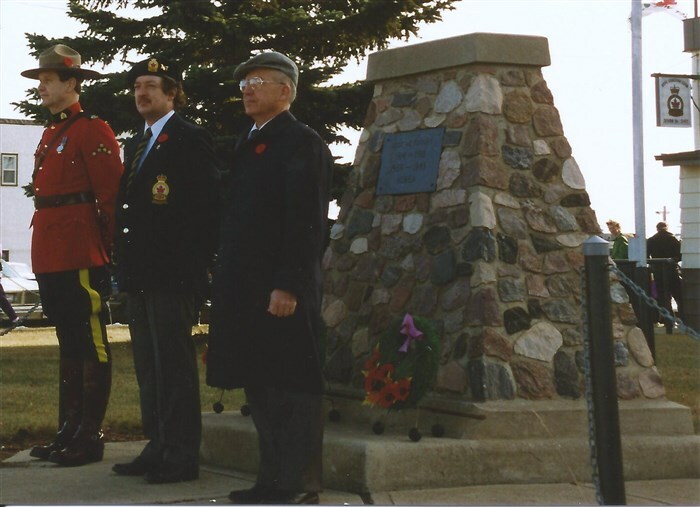 The following photograph is the Legion Cenotaph on November 11th 1987. 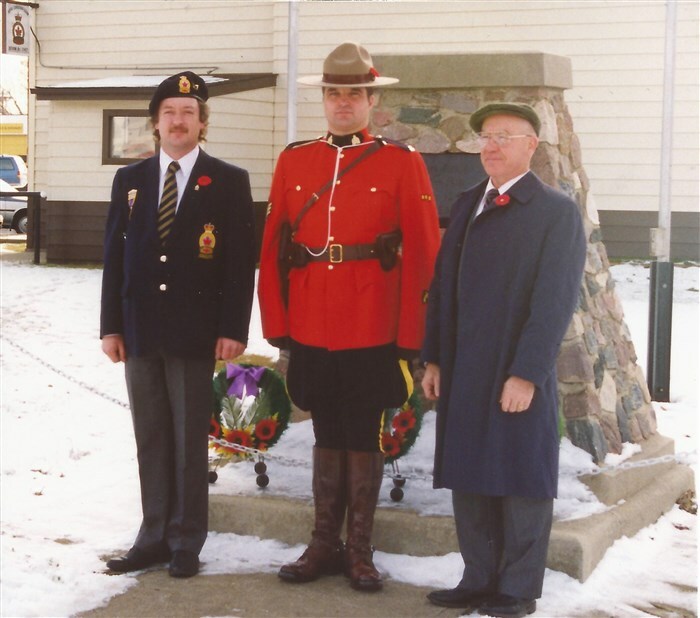 The dignitaries present to receive the salute from the Remembrance Day parade are Devon RCMP Detachment Commander Sgt Inglehart, Devon Branch President Comrade Bill Bates and the Town of Devon Mayor Mr. Dale Fisher. 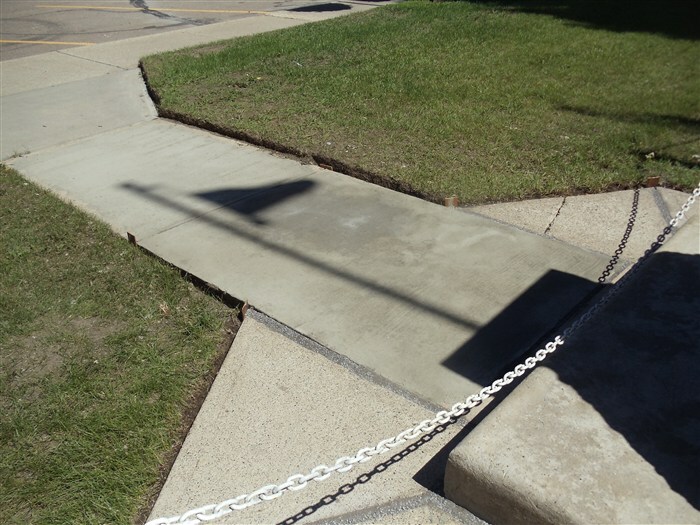 Note there is no flag poles located behind the Cenotaph. 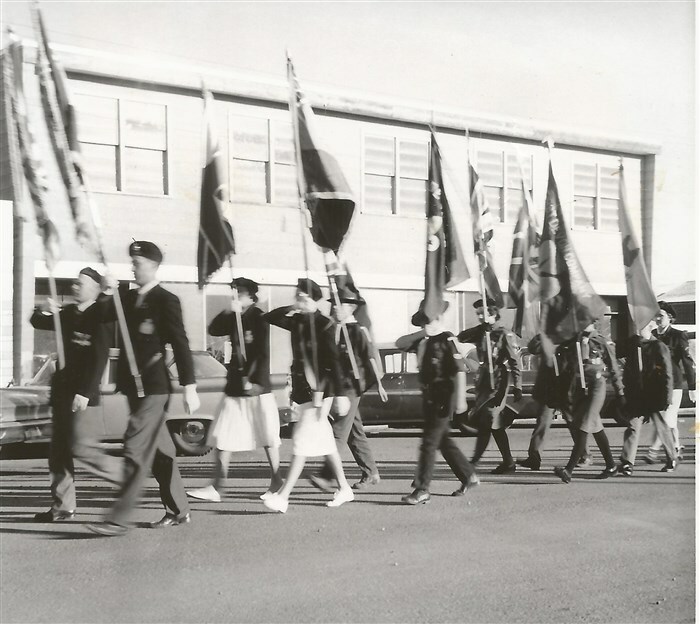 At this point in time the 3 flag poles were still located on the east side of the Devon Legion Hall. Also note that there is no businesses located in the background. 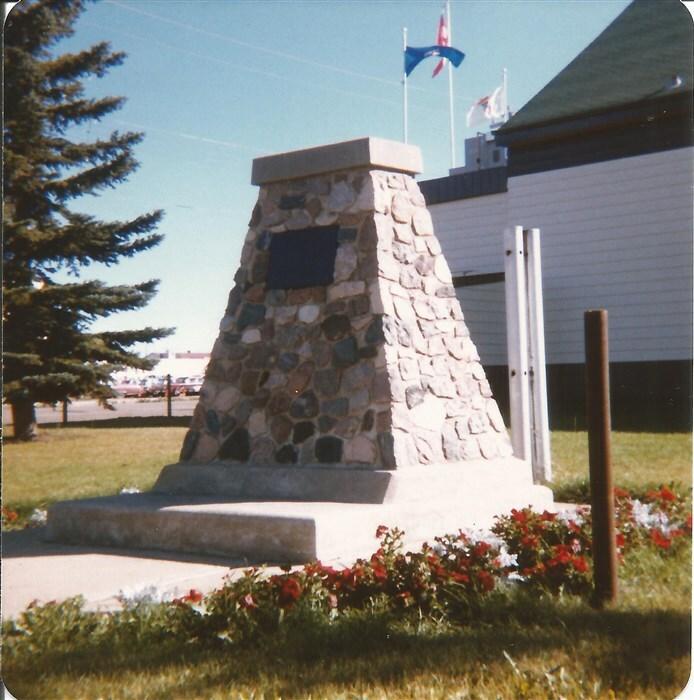 The following photograph is the Legion Cenotaph on November 11th 1989. The dignitaries present to receive the salute from the Remembrance Day parade are Devon RCMP Detachment Commander Sgt Inglehart, Devon Branch President Comrade Bill Bates and the Town of Devon Mayor Mr. Jim Henerson. Note that the 3 flag poles are now located behind the Cenotaph. 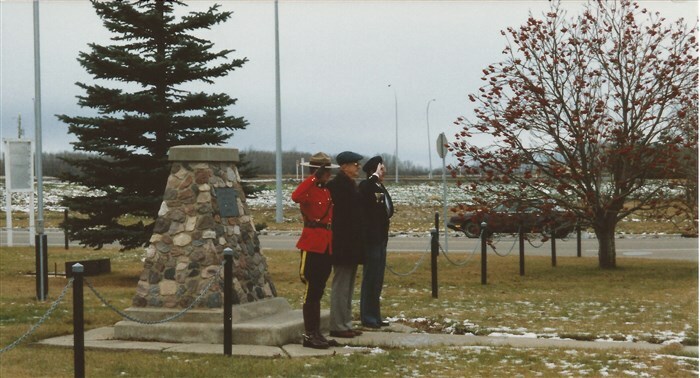 The following photograph is the Legion Cenotaph on November 11th 1990. 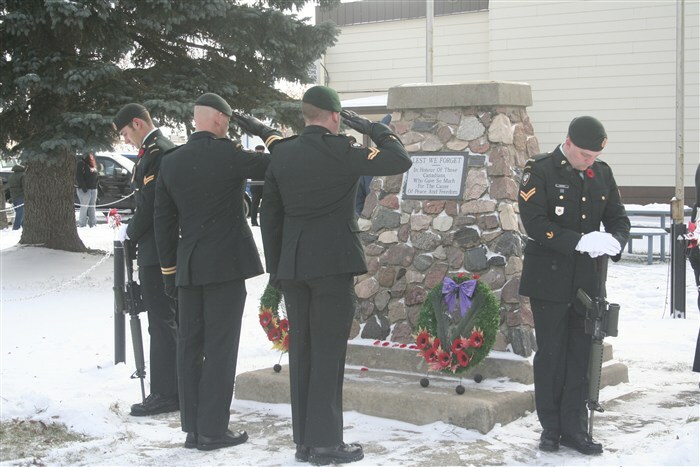 On a snowy cold windy day the Remembrance Day parade still goes on. Of interest in this photograph is that the flags are still at full staff instead of being lowered to half mast. It is believed that one or more of the flags hoisting mechanisms were frozen preventing the flags from being lowered to half mast. The dignitaries present to receive the salute from the Remembrance Day parade are an RCMP Constable, Devon Branch President Comrade Beryl Hartshorne and the Town of Devon Mayor Mr. Jim Henerson. In the early1990's the Devon Legion cenotaph was routinely adourned with flowers during the summer. In this particular photograph the flowers were representing our Nation's red and white colours. 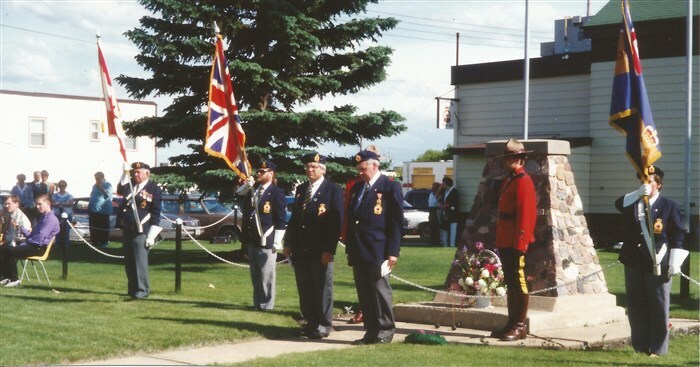 The following photograph is the Legion Cenotaph on November 11th 1992. The dignitaries present to receive the salute from the Remembrance Day parade are the Devon RCMP Detachment Commander Sgt Keese Kikkert, Devon Branch President Comrade Dave Watt and the Town of Devon Mayor Mr. Larry Price. 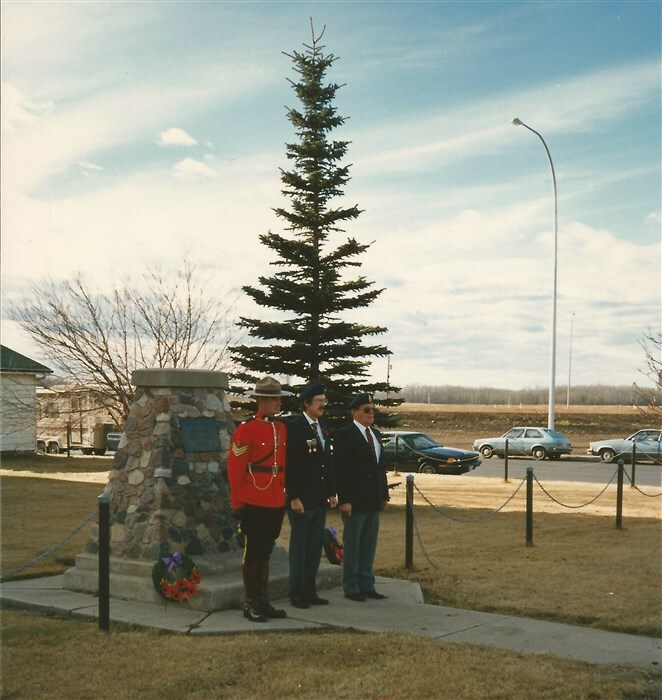 The following photograph is the Legion Cenotaph on November 11th 1993. The dignitaries present to receive the salute from the Remembrance Day parade are the Devon Branch President Comrade Dave Watt, Devon RCMP Detachment Commander Sgt David Lock and the Town of Devon Mayor Mr. Larry Price. To commemorate the 50th Anniversary of the June 6th 1944 Normandy Landings of the Second World War, the Devon Legion held a formal ceremony on the Devon Legion lawn in front of the Devon Legion Cenotaph. The ceremony was followed by presentations and a banquet within the Devon Legion Hall. 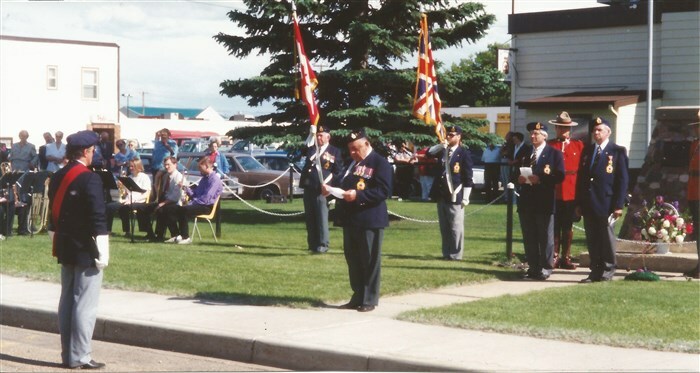 The following photograph is the Legion Cenotaph on November 11th 1994. 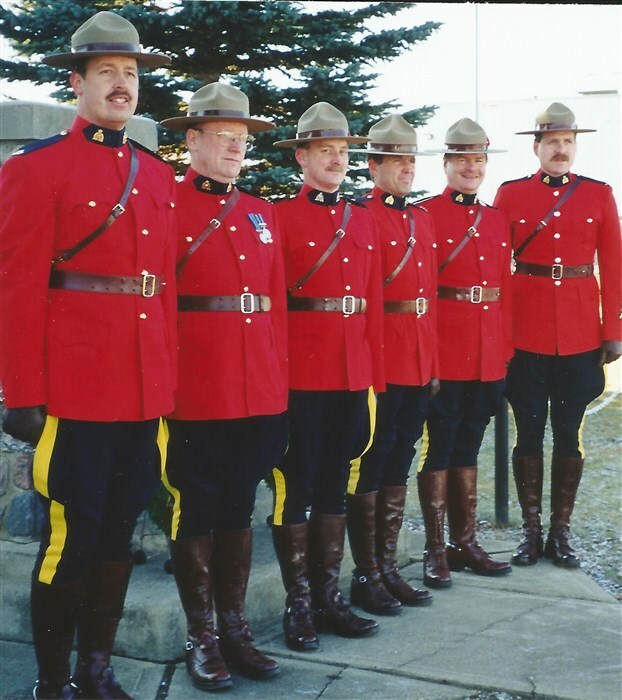 The dignitaries present to receive the salute from the Remembrance Day parade are the Town of Devon Mayor Mr. Larry Price, Legion Padre Pastor Larry Froese, Devon Branch President Comrade Ron Medlicott and Devon RCMP Detachment Commander Sgt Bill Sharpe. 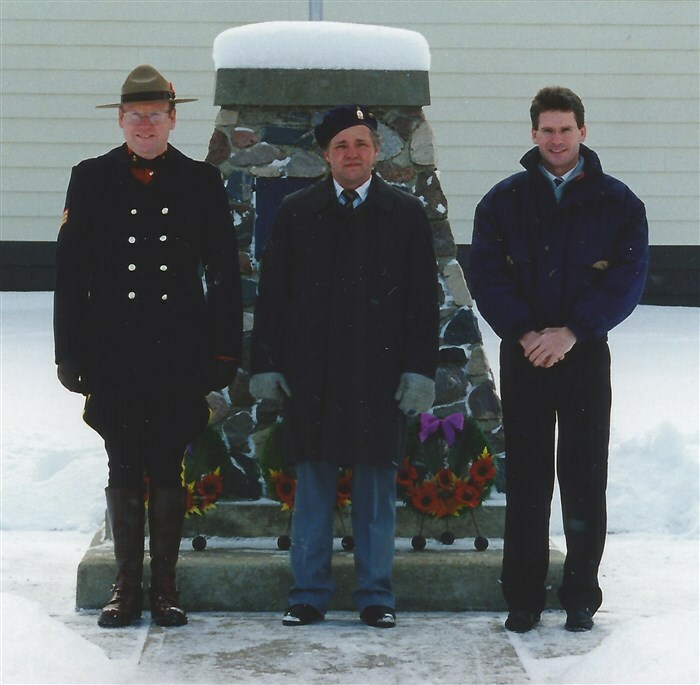 The following photograph is the Legion Cenotaph on November 11th 1995. On another snowy cold day the Remembrance Day parade marches on. The dignitaries present to receive the salute from the Remembrance Day parade are Devon RCMP Detachment Commander Sgt Bill Sharpe, Devon Branch President Comrade Ed Massia and the Town of Devon Mayor Mr. Dale Fisher. 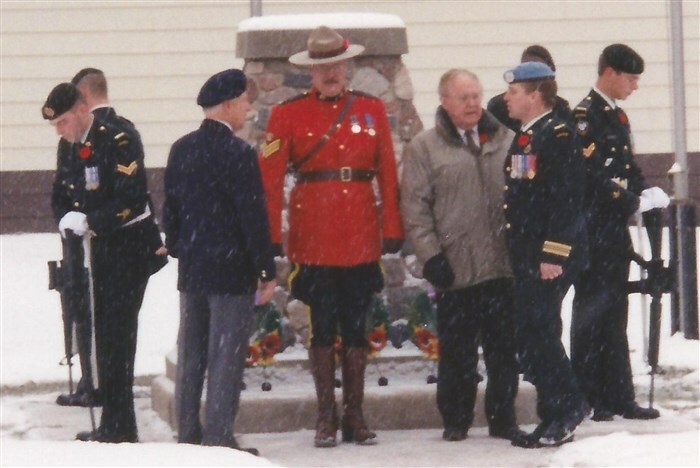 The following photograph is the Legion Cenotaph on November 11th 1996. On another snowy cold Remembrance Day. The dignitaries present to receive the salute from the Remembrance Day parade are Devon RCMP Detachment Commander Sgt Bill Sharpe, Devon Branch President Comrade Ed Massia and the Town of Devon Councillor Jerry Topola. 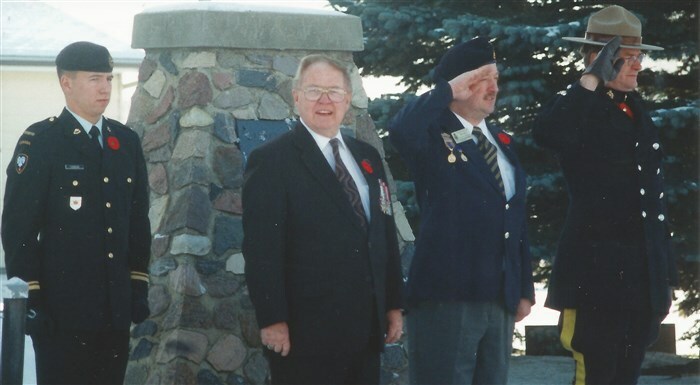 The following photograph is the Legion Cenotaph on November 11th 1997. The dignitaries present to receive the salute from the Remembrance Day parade are Devon RCMP Detachment Commander Sgt Bill Sharpe, Devon Branch President Comrade Clare Evans and the Town of Devon Mayor Dale Fisher. Visible in the back ground is the Poppy Campaign flag flying at half mast. 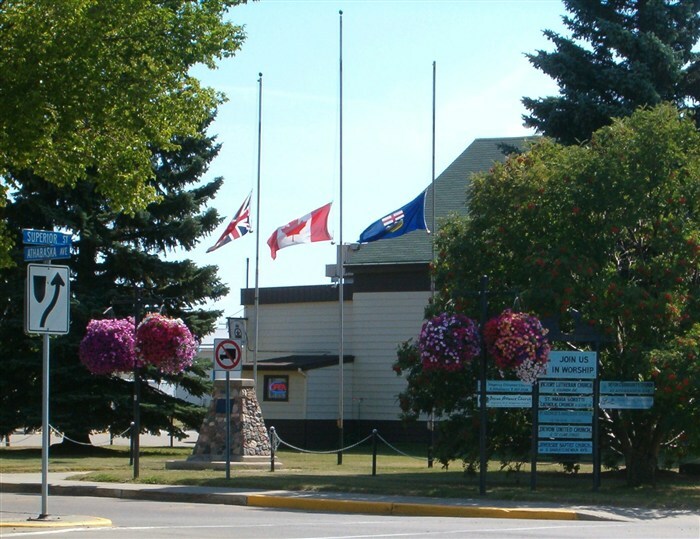 The Poppy Campaign flag is no longer flown on one of the main Legion flag poles but is now flown at full staff on the flag pole at the Legion building main east entrance door. 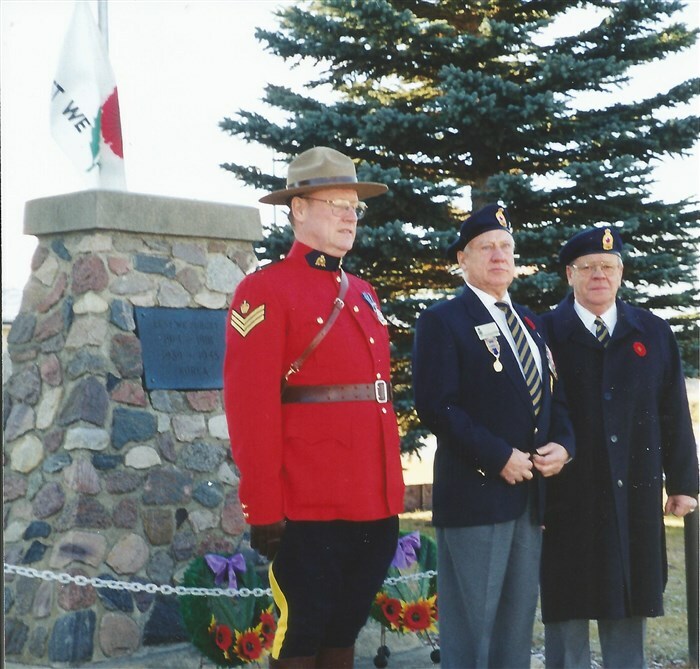 The following photograph is the Legion Cenotaph on November 11th 2000. The dignitaries present to receive the salute from the Remembrance Day parade are 1 Combat Engineer Regiment LT Jamie Thompson, Town of Devon Mayor Bob McDonald, Devon Branch President Comrade Dave Watt and RCMP CST Stan Gardiner. The 1 Combat Engineer Regiment first attended a Remembrance Day ceremony in Devon with troops on parade in 1998 after a relationship to partner in the Act of Remembrance was formed in 1997. 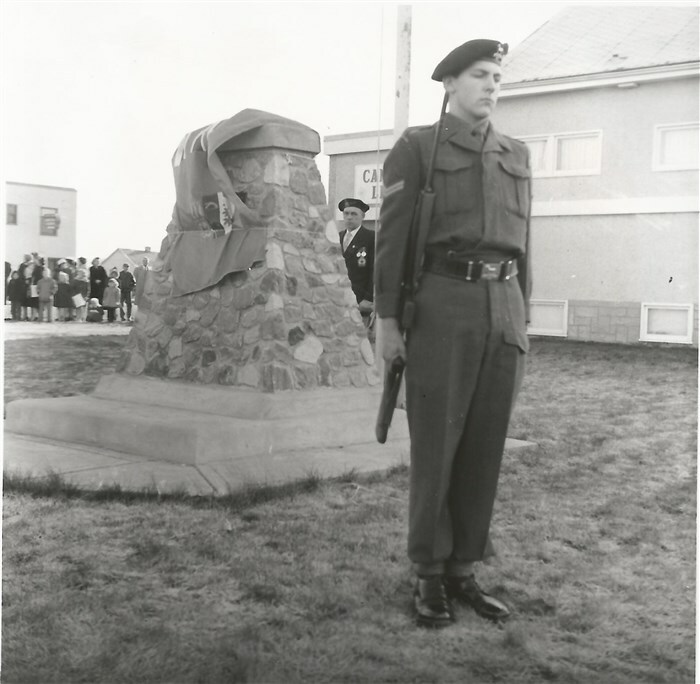 At this point in time 1CER had not started to provided an Honour Guard for the Cenotaph on Remembrance Day. 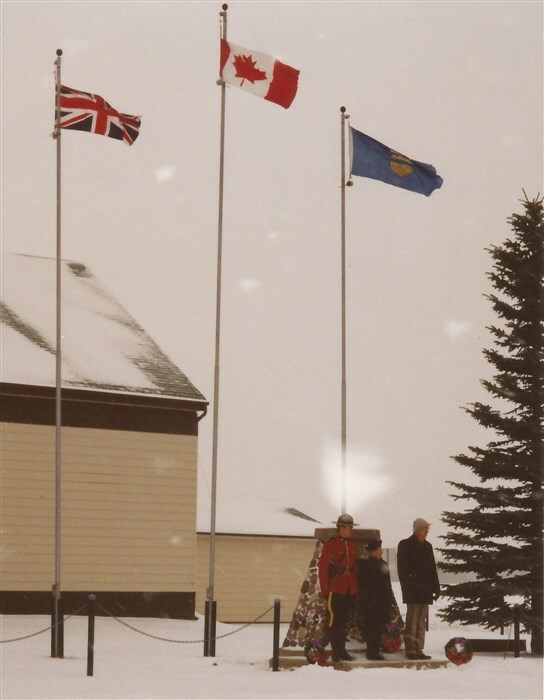 The following photograph shows as the snow is falling the dignataries are falling in to receive the Remembrance Day parade salute on November 11th 2002. 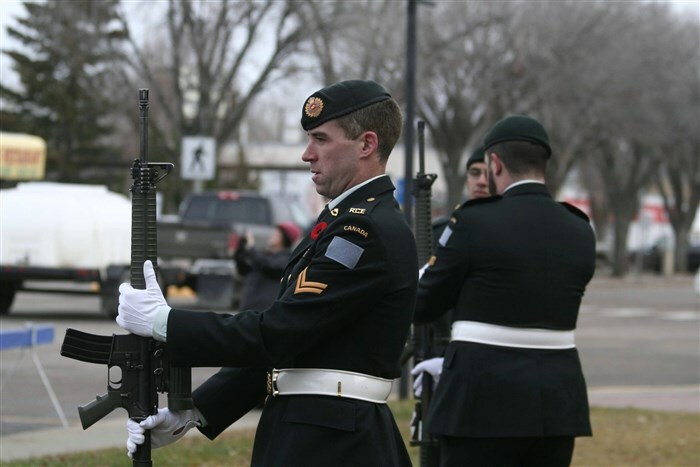 It is belived that 2002 was the first Remembrance Day in which the 1 Combat Engineer Regiment provided the soldiers for the Cenotaph Honour Gaurd. 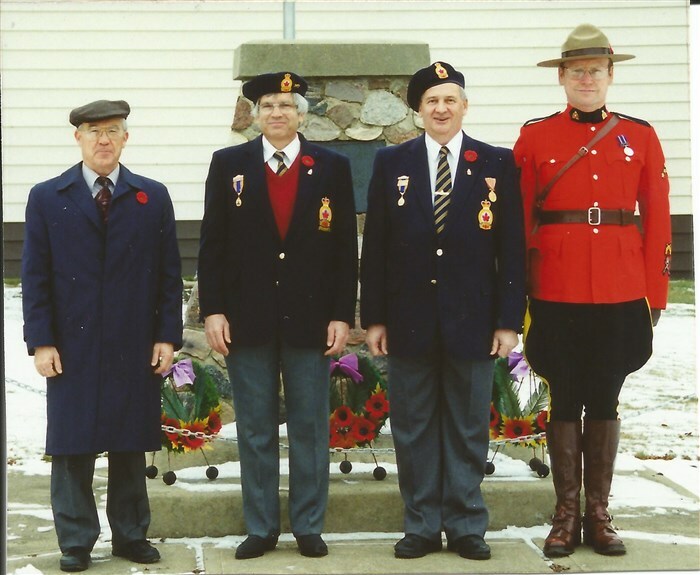 Left to right below are the Devon Legion Branch President Clare Evans, Devon RCMP Detachment Commander Sgt Bob Wright, Town of Devon Mayor Bob McDonald and the Senior 1CER officer. In 2011 the Devon Legion Cenotaph was revitalized with the installation of a new commemorative plaque honouring all those that serviced our great nation. 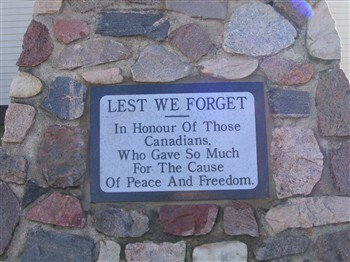 The Devon Legion would like to thank Al and Cecile Caron of Spruce Grove for their excellent art and stone work on the new plaque. The original plaque will eventually be mounted and displayed within the Devon Legion Hall. 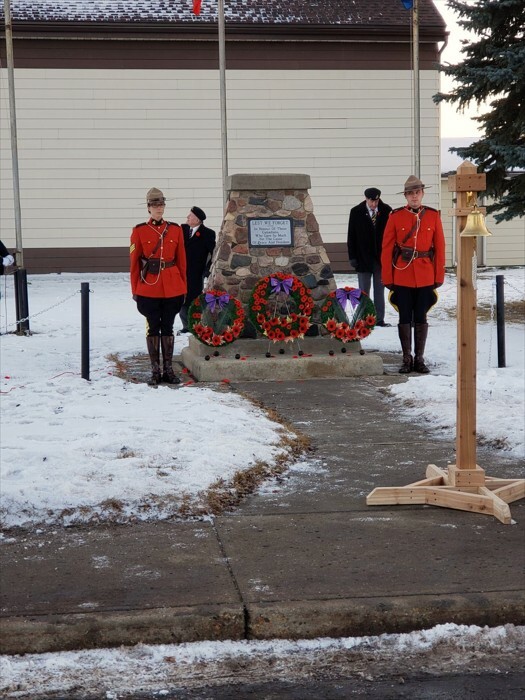 The following photograph is the Legion Cenotaph on November 11th 2013. The dignitaries present to receive the salute from the Remembrance Day parade are Devon RCMP Detachment Comander Sonia Joel, Member of Parliment James Rajotte, Town of Devon Councillor Juston Porter, 1 Combat Engineer Regiment Senior Officer, and the Devon Branch President Comrade Dave Watt. 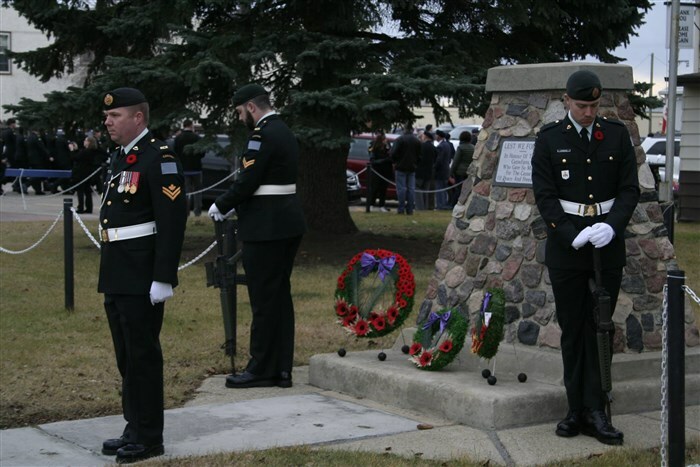 Since 1998 the 1 Combat Engineer Regiment has been attending the November 11th Remembrance Day Ceremony every year. 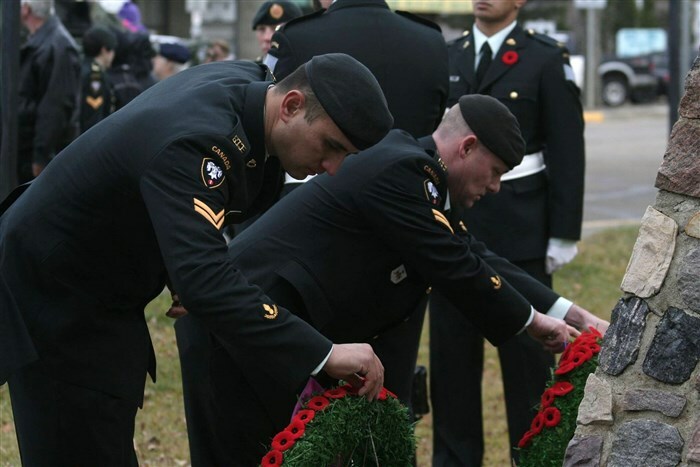 It is still being researched but it is believed that in 2002 1CER started to provide an official Honour Guard to the Cenotaph on Remembrance Day. 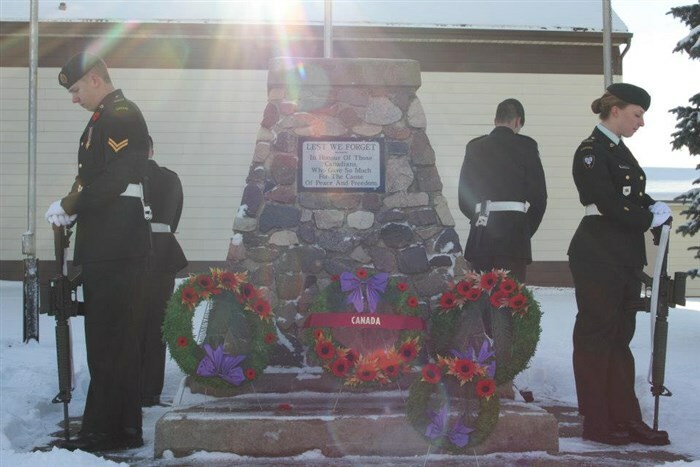 Of special interest and great important to our members of the Royal Canadian Legion was the loss of 3 Canadian Soldiers of 1CER (12 Field Squadron) from the 2007 Honour Guard on August 20th 2008 while serving in the Zhari District, Afghanistan. 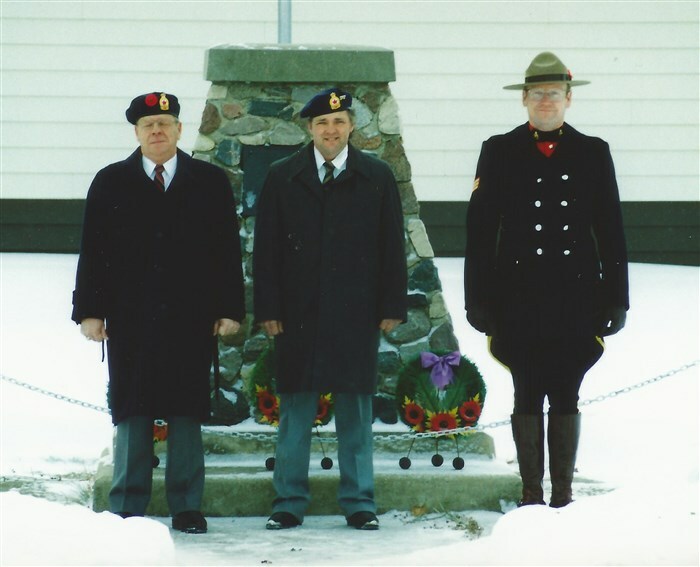 Those three soldiers (Sgt Shaun Eades, Cpl Dustin Wasden and Sapper Stephen Stock) were part of the Honour Guard for our 2007 Remembrance Day Ceremonies so our Cenotaph is truly a sacred monument. 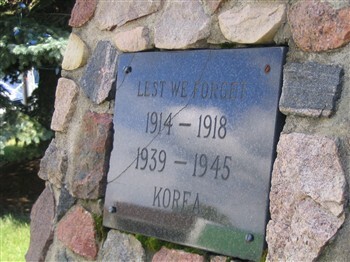 "CENTENNIAL ANNIVERSARY OF THE WORLD WAR ONE ARMISTICE"